We were up for the Match in Croke Park on Sunday at The Junior All Ireland Final which featured a team from our area Derrytresk and a team from Galway called Clonbur. Unfortunately Derrytresk were beaten by the narrow margin of one point. My nephew Caolan played on the team and I was bitterly disappointed for him, his team mates and the whole Derrytresk community who had poured their life and soul into this campaign which saw them lift a county and provincial championship for the first time in the club’s 109 year history. Like many people we have a set routine when we visit Croker. We park the car as near as we can to “The Maples” a small family run hotel which dates back to the early 1900’s. I can recommend the matchday lunch. Then it is only a ten minute stroll down Iona Road to upper Alphonsus Road onto the Lower Drumcondra Road past the famous gathering point at Quinn’s Bar, down Clonliffe Road arriving at Jones’ Road for the Hogan Stand or St Joseph’s Road for Hill 16 or The Cusack. I spotted this sign on a garden gate on Iona Road. 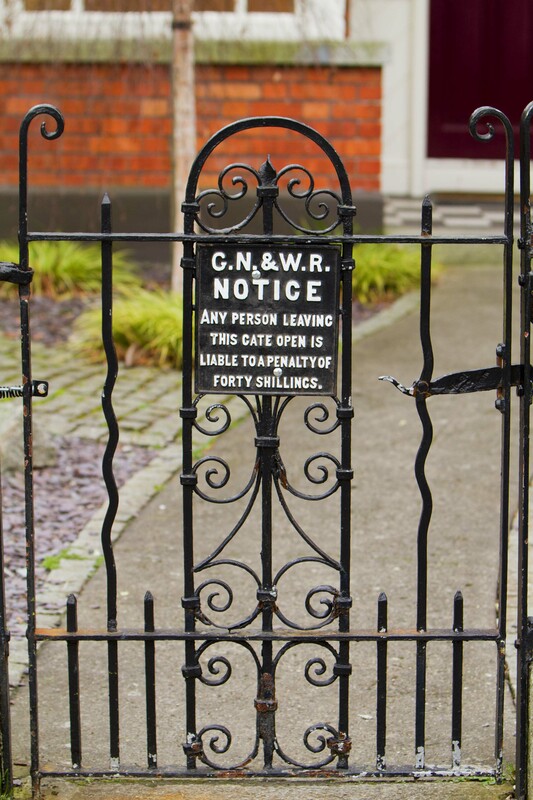 I’m guessing that the sign is from a Railway company The Great Northern and Western Railway. Sadly I also remember when shillings were legal tender.